June Fabrics Technology Group has updated its PdaNet software for the Palm Treo 700p/755p and Palm Centro. 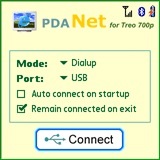 PDANet allows your Windows computer to go online by connecting to your smartphone via a USB cable or Bluetooth. The app works nearly instantly with no setup necessary. PdaNet goes through the unlimited data plan on your phone and does not require any extra service. PdaNet for Treo 700p/ 755p v4.12 is available with a free trial and costs $34.00 to register. It is also available for the Treo 650 & 680 and Windows Mobile devices. Nice Concept. Anyone using it? I love seeing products where the wires and connectors already in place can be utilized for more funtionality. Imagine a world where all services of all devices were integrated and they call functioned properly. This is one more step in the marathon. I already have a little $15 USB BT dongle for my laptop that gets me online with my Treo 680. BT causes no log jams on EDGE connections. But this is an alternative if you don't mind the wire. RE: Nice Concept. Anyone using it? I used an older version of this app extensively on my 700p in '06-'07 when I had the need to occasionally work off-site at a remote location that didn't have any highspeed connectivity. But since wi-fi is rather widespread nowadays I haven't had the need to use it in well over a year. It's a solid little program but for EVDO tethering, I'd probably feel safer with a wired connection (for speed, stability, and power consumption reasons). SV has been porposing a system of seamlessly interconnected wireless devices for several years now. I really have been quite disappointed by Bluetooth, after nearly a decade of missteps and false promises. Between lame BT stacks & software on even "modern" desktop OSes, crippled (Verizon) or antiquated (Palm) hardware, BT has really turned into nothing more than a glorified wireless headset standard. And don't even get me started on the hit or miss (mostly miss) of trying to get most OEM in-car BT systems fully operational! And A2DP has kinda caught on but until it appears on an Apple device, it'll never gain mainstream traction. Having to worry about keeping a pair of headphones charged just seems like the answer to the question no one was asking! Ditto. BT connectability (is that a word?) is a sad joke. Connecting my laptop to Treo is a terribly fragile ordeal. Looks like the BT association needs some strong improvement. The "terribly fragile ordeal" is why this program is so useful. Supposedly it will do BT also, but I haven't tried that. I just use a sync/charge cable to attach the Treo. Works great in a hotel room with pricey internet or wireless that doesn't work. Why pay for this? Internet sharing USB/BT with PAN is standard on all WM phones and is already plug'n play with no installation. Especially through USB it is just a matter of connecting the phone. I think you may have missed something central here.. this solution runs on Palm OS, not windows mobile. Whilst tapping into your phones 3G is easy and inbuilt on WM, that's not the case on Palm OS, bless Colligan's heart. That's why you need to pay for it. Maybe I'm missing something. My laptop and Centro talk thru BT and access the net out of the box. What woudl this software ad? If your laptop has BT built-in, then your ahead of the game. Basically, it's a choice between this SW + cable or BT dongle (unless built in) and your Treo's BT. Got ya. My laptop had BT built in. So if I was to use a cable then I would need it. Thanks Live Faith.